When there's snow, there's icicles, and they decorated everything following yesterdays snow. Icicles formed one after the other and lined the roof across the entire length of the cabin, something I've not seen before. The blustery winds were so strong it caused the tips to freeze in motion. ...and discovering interesting twists and turns in their shapes. Spring, are you going to stick around now? Dang, I thought you lived in the "south". But your ice is still pretty!! From you, yes Patti. 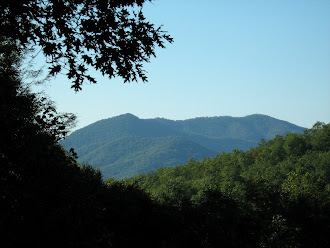 We are on the north side of the Cowee mountains, I suppose that puts us in the north, LOL! Hello Lise, I love this series of photos! Beautiful and dreamy. Thanks so much for sharing. Thank you Linda and Vicki. I enjoyed taking them. Margy, I hope you can keep some of that moisture around, I know its been a dry season for you.